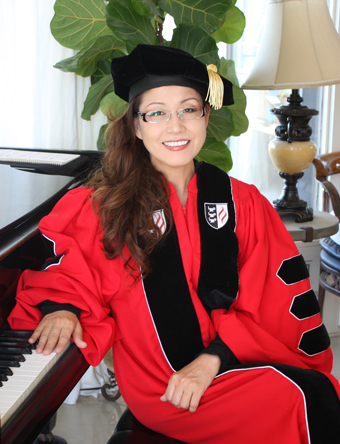 I am a pianist, music director, amateur painter, jewelry designer (Dotori Jewelry) and entrepreneur (Founded Nova Skincare USA). I received my DMA (Doctor of Musical Arts) at Claremont Graduate University, MM (Master of Music) in piano performance and pedagogy at California State University, Northridge (CSUN), and was granted a Pedagogy scholarship by the Music Teachers' Association of California (MTAC) in 1997 at CSUN, where I was an assistant instructor in the pedagogy program. I have studied under Dr. Borja Otero (Spain), Dr. Charles Fierro, Dr. Jeanine Jacobson (CSUN), Dr. Daniel Pollack (USC), and Dr. Hao Huang (CGU). My performance on television in "An Endless Musical Journey" by Ornosky in Los Angeles in 1996 included classical piano performance combined with an exhibit of my impressionist oil paintings. I was an accompanist at church for 15 years and have had numerous concert appearances in South Korea and the United States. I received awards from the Olympic chair for my contributions to music at the 1986 Asian Games and the 1988 Olympics in Seoul. I have been active in the MTAC Orange Coast Cities Branch for many years and have maintained a private studio in Laguna Beach since 1998. I have taught many music major scholarship students. My inspirations are pianist Andre Watts and Thomas Edison. I admire their creativity and perseverance.